Useful technologies, once invented, often become adopted and adapted for a variety of functions. Blockchain, the technology underlying Bitcoin, is no exception. Originally created to ensure that Bitcoin transactions are secure and verifiable, blockchain technology is now being tested and deployed in a multitude of industries, from healthcare to supply chains. The utility of blockchain stems from the fact that it serves as a permanent record of encrypted transactions that is stored on multiple computers—nodes on a shared network. This means there is no single point of failure. Should one node be compromised, multiple backup records remain available and uncorrupted. This is why blockchain is frequently called an immutable, distributed ledger. Unsurprisingly, companies around the world have shown strong interest in implementing blockchain in their operations. But is blockchain the cure-all for all enterprise woes? 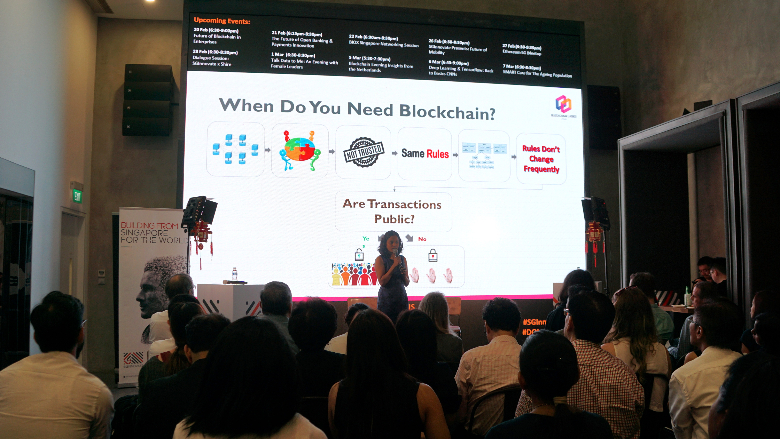 Not necessarily, according to experts at the Future of Blockchain in Enterprises seminar, organised by SGInnovate and Blockchain Ladies Asia on 20 February 2018. Thinking about setting up a blockchain for your company? Before you take the plunge, read on for a few tips we picked up from the speakers, Ms Priya Mohan, insight and customer strategy manager at software multinational corporation Oracle, and Ms Pandu Sastrowardoyo, co-founder of blockchain consultancy Blockchain Zoo, on how to decide whether or not your company really stands to benefit from the technology. Setting up a good blockchain takes effort and resources. Hence, companies should first properly evaluate whether a blockchain-based solution is “worth it”, said the speakers. “Blockchain is complicated. It’s costly, it sometimes has issues with performance, and it is really hard to support—the maintenance is intensive. So, if you want to implement blockchain, there needs to be a good reason for it, and that reason needs to be business value,” said Ms Sastrowardoyo. This sentiment was echoed by Ms Mohan, who said that there are two main payoffs of having a blockchain. The first is the lower cost of validating and keeping track of transactions. The second and more substantial advantage of implementing a blockchain lies in the elimination of intermediaries. Ms Mohan cited the example of how numerous companies in the world transact via the Society for Worldwide Interbank Financial Telecommunication (SWIFT) network. To join the network, companies pay SWIFT a one-time access fee, a recurring support fee, and a commission on each transaction. This adds up to a substantial amount of money. With a blockchain, companies can perform direct peer-to-peer transactions (in the style of Bitcoin) without engaging SWIFT, accruing significant cost savings over the long run. In deciding whether or not one’s company truly needs a blockchain-based solution, Ms Mohan advised enterprise owners to ask themselves: Is there a need for a shared database among multiple transacting parties? Do you really need an immutable, non-modifiable and verified log of transactions? Are the rules of transacting the same for all parties involved? If the answer to these questions is “yes”, only then should the company proceed to consider which type of blockchain is suitable. Ms Sastrowardoyo explained that blockchains can be broadly classified as permissionless or permissioned blockchains. Bitcoin is an example of a permissionless blockchain because anyone can freely join the network to perform and validate transactions on it. On the other hand, a permissioned blockchain is one where only authorised entities can access, transact and validate transactions on the network. When setting up a blockchain, another key consideration is its scalability, which is closely tied to the way transactions are validated on the blockchain network, said the speakers. These consensus protocols, as they are referred to by the blockchain community, could be as simple as a single person giving his or her stamp of approval, or it could require every entity on the network to do a round of fact-checking and problem solving before a transaction is deemed valid. The latter method, which Bitcoin uses, is already encountering problems of scalability—transactions take an average of ten minutes to be validated, which may not be fast enough for enterprise needs. Once the rules have been decided upon, they will govern all downstream operations on the blockchain. Therefore, it is important for companies to think through these rules properly, the speakers advised. In addition, companies may want to plan for contingencies should there be a need to change these protocols, said Ms Sastrowardoyo. This entails thinking about the architecture of the blockchain, how it might be adapted to accommodate a change in business process, as well as how to distribute new nodes and access old data after a change has been made. “Clearly, it’s easy to build a blockchain, but it’s really difficult to build a good blockchain,” concluded Ms Sastrowardoyo.